In this article you’ll discover the most recent findings about Instagram users and how this could impact your social media marketing. 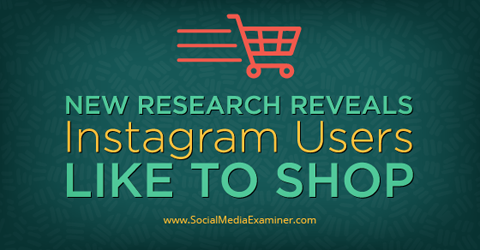 Discover new research that shows Instagram users are shoppers. Instagram announced in December 2014 that its worldwide user base passed 300 million, a leap of 50% from the 200 million milestone it had achieved just nine months before. Both the rapid surge in a short period of time and the fact that Instagram’s users now outnumber Twitter’s 288 million worldwide users has gotten marketers’ attention. The critical question remains: Who’s on Instagram? Marketers started getting excited about Instagram when the first studies indicated that the audience seemed to use the channel for shopping. Users were sharing product photos with friends, making comments, liking and getting opinions. Unlike Facebook users who report that their primary reason for using that channel is to connect with friends and family, Instagram users may have more of a shopping drive. Instagram’s audience is using the channel to get information about products and services before shopping. Image: Shutterstock. Specifically, 70% of the 16,000 users in Iconosquare’s 2015 study reported that they have already looked for a brand on Instagram. While many marketers have used contests and giveaways to win followers on other social channels, on Instagram, 62% of users follow the brand simply because they “love” the brand. Forty-one percent follow or would follow to take advantage of perks and giveaways. Finally, rather than resenting brand intrusion, 65% of Instagram users report that they feel flattered when a brand likes their post. Where the Iconosquare and Business Insider studies explored user motivation and demographics, other studies have measured what Instagram gets done. Counting likes, shares and “re-grams” (like retweets) helps marketers investigate which of their efforts resonate with their target audience. All of these actions taken by targets are called “engagement” collectively. Some marketers are now excited by the fact that Instagram users are engaging with brands at a rate far higher than other social media channels. Socialbakers, a social analytics and research service, analyzed its Q4 2014 data and found Instagram’s engagement rate far higher than Twitter’s. 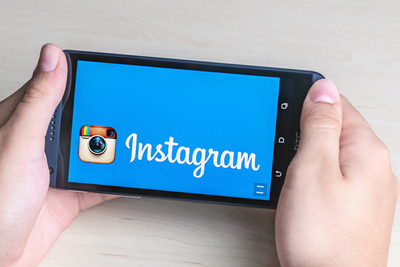 Socialbakers reports that 3.31% of users engage with each brand post on Instagram. An Instagram post sent to 10,000 users gets 331 users liking, sharing and “re-gramming”—basically boosting marketing efforts for no cost. A tweet sent to 10,000 users, on the other hand, results in just 7 others pushing content to friends and connections. Considering that many businesses have fewer than 1,000 followers, many posts get zero engagement on Twitter. The split between engagement on Instagram and engagement on Facebook is nearly as wide. According to a November 2014 Instagram study from research firm L2, users interacted 18 times more on Instagram than Facebook. Mighty Forrester Research revealed a similar gap when they compared Facebook with Instagram engagement in April 2014. Instagram engagement rate is far higher than Facebook or Twitter as of April 2014. 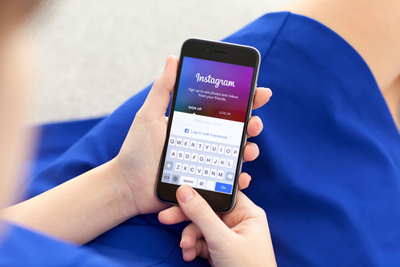 Study authors from Forrester raise the possibility that the engagement rate on Instagram is high because it is a relatively new platform, and as yet, few brands are there. Fewer posts vie for user attention. Microsoft just signed up for an account in November 2014. With the Simply Measured Instagram 2015 study revealing that more brands are moving onto Instagram, the number of eyeballs per post will diminish as consumer attention gets more diluted. In Q3 2012, just 40 of the top 100 Interbrand companies had an Instagram account; however, by Q4 2014, 82 of the 100 Interbrand companies did. These are the leaders in their industries. Small- and medium-sized businesses will follow their example. 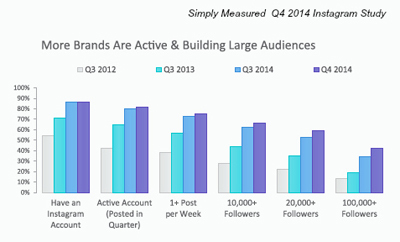 Brands with 100,000 or more followers on Instagram have tripled since Q3 2012. With Facebook leveling off at 71% of all adult Internet users having an account, it makes sense that Instagram’s momentum, too, will eventually slow down. However, Instagram is the hot commodity for 2015. A December 2014 study from Frank N. Magid Associates, a November 2014 study from Cowen & Company and a September 2014 study conducted by AVG, cited in eMarketer, found that 44% of 18- to 29-year-olds and 62% of 11- to 16-year-olds had used Instagram in the previous month. In comparison, only 18% of Baby Boomers (ages 45 to 60) and 10% of those 60 and older used Instagram in the past month. Forty-four percent of Millennials used Instagram in the past month, preferring it over Facebook by nearly 2 to 1. This 18 to 29 age group’s preference for Instagram over Facebook and other channels is startling. This group greatly prefers Instagram to Facebook (with just 23% bothering to use Facebook in the past month), LinkedIn (19%), Pinterest (27%) and Twitter (33%). 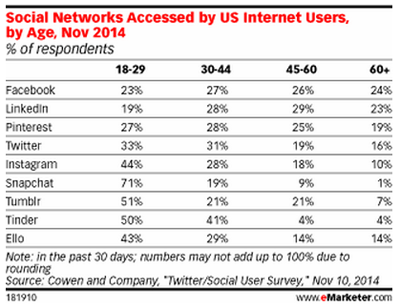 Newer social channels like Snapchat and Tumblr captivated an even larger share of the age 18 to 29 market. More evidence that young adults look for independence from their parents, even in their social media channels! 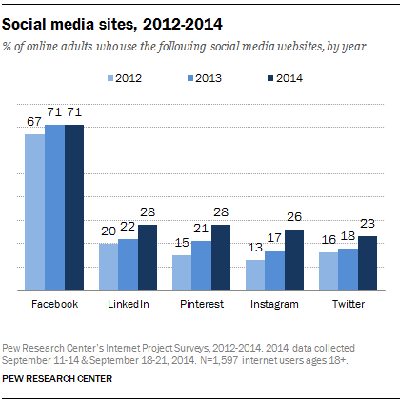 The Pew Research Center echoes that Instagram is the playground of those 29 and younger. Their 2015 study of 1,597 Internet users found that 53% of Internet-using adults ages 18 to 29 use Instagram. Further, nearly half of this population uses it daily. Instagram has momentum, too. Where Facebook’s growth has stalled at (albeit an impressive) 71% of all Internet users for both 2013 and 2014, Instagram’s growth has doubled from 2012 (13% to 26%) and increased by 53% from 2013 to 2014 (17% to 26%). Instagram audience numbers are just edging out Twitter’s. Key Takeaways: With the majority of the Instagram audience younger than 30, it’s no wonder automotive, technology and apparel brands have been leaders there. Simply Measured’s Q4 2014 Instagram Study of Interbrand Top 100 Brands (basically how Apple, GM, Microsoft and 97 more companies use and benefit from Instagram) studied 6,293 posts from 82 brands for presence, engagement, content and more. Simply Measured compared posts per month by brand type. In 2014, 14 of the top automotive brands were posting an average of 40 times per month. Ten of the top technology brands posted 15 times per month. 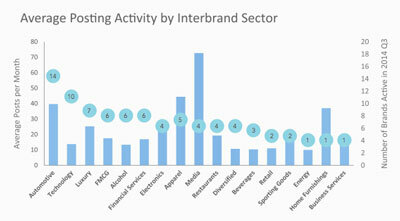 Five of the top apparel brands posted an average of about 45 times per month. And while only four of the top media brands measured by the Interbrand 100 had Instagram accounts, these brands posted more than 70 times each month. Marketers have gotten the message that if the buyer is younger than 30, he or she is most likely on Instagram. Age isn’t the only factor when narrowing a target audience. To get a more robust picture of just who is on Instagram, we turn to two more recent studies.Iconosquare, a provider of analytics for Instagram accounts, published a study in 2015 of 16,000 Instagram users, which reveals specific details about the channel’s audience. This study and Business Insider’s August 2014 Instagram Demographics Report help marketers better understand the Instagram audience. Gender: Business Insider found the Instagram audience consists of 68% women. The Iconosquare study put the share of women at 64%. At this time, women dominate Instagram. Image source: Shutterstock. Technology: Business Insider found Instagram users split down the middle when it comes to smart device usage. Half of users reported using Apple iPhones and half Android. Neighborhood: Also according to Business Insider, rural residents are less likely to be using Instagram. Seventeen percent of U.S. adult urban residents use the platform, compared to 11% of adult rural residents. Geography: Seventy percent of Instagram users live outside of the United States. Importer/exporters and companies doing business internationally should be interested in this fact. Key Takeaways: The figure showing that 48% have college degrees is skewed because both Iconosquare and Business Insider are measuring young populations. A majority will still be in college or at least below the typical college graduation age. The 50% increase in audience numbers in 2014 alone mentioned at the start of this article is just one figure reflecting momentum. As the chart above shows, too, the figure for top brands with more than 100,000 followers has more than tripled since Q3 2012. While 82 of the 100 top brands are now active on Instagram, many small- and medium-sized companies are still waiting on the sidelines, weighing their options. Proud that they’ve gotten Facebook squared away and working for them, they may not be ready to jump into the Instagram fray just yet. As it was with Facebook and blogging, however, just because a company doesn’t have an official presence on Instagram doesn’t mean the company isn’t there. Hashtags proliferate on this new social media channel, and participants use it to discuss the companies they patronize. Listening on Instagram to consumers mentioning your brand or even your competitors and industry is the first step in understanding the channel. Further, with more studies proving the effectiveness of using several digital channels in concert to repeat the same messages, brace yourself for Instagram to push the feasibility of adding yet another social channel to the digital marketing mix. Instagram’s home page boasts a Mercedes-Benz case study explaining how combining Facebook and Instagram ad campaigns raised site visits by 580%. It may be time for your brand to experiment with Instagram. Image: Shutterstock. If your company has the resources and a young audience, an experiment with Instagram could be in your future. Stay ahead of the curve when you read our Instagram Marketing: Your Complete Guide to Instagram Success, which includes articles on the steps to getting started, using Instagram to promote products and more. What do you think? Could your audience be on Instagram? Do you listen to what consumers are saying about you or your industry there? Leave your comments and questions below. 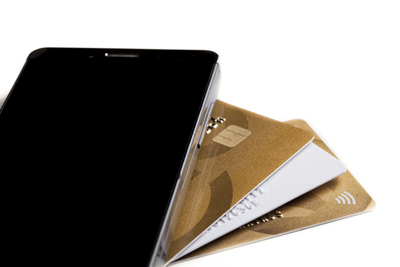 Woman on Instagram photo, Cell phone and credit card photo and Instagram on phone photo from Shutterstock.